Do they help? Greens and whole food powders contain a variety of nutrients such as carotenoids, antioxidants, amino acids, enzymes, nucleic acids, fiber, vitamins and minerals from plants which may have some healthful benefits. Chlorella, an ingredient found in some greens products, may help to lower triglycerides and total cholesterol. However, these products should not be considered a substitute for a healthy diet rich in fruits and vegetables. Also, be aware that claims of antioxidant activity and "alkalinizing" effects do not necessarily translate into proven health benefits (see "What They Do"). What type? Most products tend to be high in fiber, low in sodium and fats, and usually only contain a small number of calories. Some contain additional ingredients such as prebiotics, probiotics, digestive enzymes, or added fiber. Unlike protein powders and meal replacements, these products typically provide little protein (see "What CL Found"). (If you want to supplement with protein, see our Protein Powders Review). Which brand? ConsumerLab.com discovered that one of the greens and whole food products it selected and tested had unacceptable contamination with lead (See "What CL Found"). Among those that were Approved for quality, CL selected Top Picks among unsweetened powders, sweetened powders, and capsules based on features, cost, and, for powders, taste. How to Use? Products sold as powders are typically mixed with water or other liquids. Although many greens products contain a long list of ingredients, specific amounts for each ingredient are not always provided. If you are looking for a particular active ingredient, such as CoQ10 or probiotics, and the amount is not listed, you may want to consider getting it from a separate supplement (see What to Consider When Using). Cautions: Greens products should not be considered a substitute for a healthy diet rich in fruits and vegetables. While most of the food ingredients in greens products are generally safe, some may contain herbal extracts, vitamins and minerals, and other ingredients that could potentially cause unexpected side-effects and/or interact with other nutrients and drugs. Other common greens ingredients have been reported to cause side effects: chlorella may cause gastrointestinal side effects such as diarrhea or constipation, and allergic reactions and other adverse events have been associated with the use of Spirulina (see Concerns and Cautions). The main ingredients in most foods and supplements marketed as containing "greens" are typically the chlorophyll-containing leaves or the sprouts of alfalfa, barley, and wheat (including Kamut, a trademarked wheat), sprouted grains, and various forms of algae (spirulina, chlorella, and kelp). Additional ingredients often include "whole foods" such as vegetables and fruits (as well as their extracts), whole herbs and herbal extracts, probiotics, mushrooms, and enzymes. Greens and whole food powders became popular as consumers became concerned about increasing their daily intake of fruits and vegetables. There are now many powdered green drinks on the market — each claiming to provide the nutritional benefits of the whole, unprocessed green plants and vegetables that are often lacking in our diets. The ingredients in these products contain many different biologically active components including carotenoids, antioxidants, amino acids, enzymes, protein, nucleic acids, fiber, vitamins, minerals, and various other phytonutrients. An increasing number also include probiotic organisms and prebiotics. The products tend to be high in fiber, low in sodium, and typically have no cholesterol — all desirable features. They are also generally low in fats, particularly saturated fats, and normally do not contain any hydrogenated ("trans") fats. Usually half or more of the weight of the powder is carbohydrate (of which about half is dietary fiber and a quarter is sugar). Unlike protein powders and meal replacement powders and drinks, most greens/whole food powders provide little protein (generally only 1 or 2 grams per serving) and serving sizes are typically smaller (only about 8 grams versus about 25 grams for protein powders). Due to modest serving sizes and lack of fat, the "greens" products usually contain only a small number of calories per serving — about 10 to 30 calories — the exception being products with larger serving sizes, such as those with added protein. The popularity of these products is based on the belief that powders made from "whole food" or "greens" are an easy alternative to eating vegetables and fruits on a daily basis and that they may help increase energy levels, detoxify the body, improve digestion, alkalinize the body, and provide antioxidants to improve overall health and well-being. While they may provide some benefits, they should not be considered a replacement for a healthy diet rich in fruits and vegetables. Dried, powdered, and/or processed fruits and vegetables do not contain the full breadth of nutrients and chemical compounds (fiber, volatile oils, etc.) found in fresh fruits and vegetables. The Centers for Disease Control (CDC) recommends about 2 to 4 cups of vegetables and fruits per day for optimal health. To find out how much the CDC recommends for you (based on age, gender and activity level). Chlorella and spirulina -- Cholesterol-lowerers? Chlorella, a source of carotenoids such as lutein, zeaxanthin and beta-carotene, and an ingredient in some greens and whole food powders and pills, was shown in one clinical study to significantly lower triglycerides and total cholesterol levels in men and women with mild hypercholesterolemia (Ryu, Nutr J 2014). In the study, 5 grams of chlorella taken daily (4 tablets each containing 416 mg of chlorella powder -- taken with water immediately after each meal) for 4 weeks significantly reduced triglyceride levels (by 10.3%), very low-density lipoprotein (VLDL) (11%) and total cholesterol (1.6%). (Several products in this review provide chlorella, although most don't list the actual amount, as chlorella is just one ingredient in a proprietary blend. Only one product listed the amount of chlorella per serving: Vibrant Health Green Vibrance claims 1 gram of chlorella per 11.83-gram scoop.) (Also see Concerns and Cautions for chlorella). A study among non-obese and obese men and women in Korea found that 8 grams of spirulina consumed daily for four months significantly reduced total cholesterol (from an average of 191 mg/dl to 170 mg/dl) and LDL cholesterol (from an average of 120 mg/dl to 109 mg/dl), but only among those who were not obese (Park, Nutr Res Pract 2016). However, HDL and triglycerides were not significantly affected, nor was the LDL/HDL ratio. The researchers speculated that obese men and women may need a higher dose in order to have a similar effect. The study was partially funded by Earth Spirulina Co. of Korea, which provided the product. Obesity is characterized by chronic, low-grade systemic inflammation which puts people at risk for diseases such as cardiovascular disease, diabetes, and cancer. To determine the effect of Juice Plus+ fruit and vegetable concentrates on systemic inflammation, a placebo-controlled study was conducted among 56 obese adults put on a low fruit and vegetable diet and given Juice Plus+ Orchard Blend (2 pills), Garden Blend (2 pills), and Berry Blend (2 pills) daily with meals for 8 weeks. JuicePlus+ did not cause significant improvements relative to placebo in systemic inflammation (as measured by CRP levels), nor in cholesterol levels, weight, body mass index, waist circumference, or quality of life. Total lean body mass increased in the Juice Plus+ group, although not to a degree which was statistically significant relative to placebo (Williams, Nutrients 2017). Oddly, the researchers concluded that the Juice Plus+ concentrate "improves the metabolic profile... by reducing systemic inflammation and blood lipid profiles," although these claims do not appear to be supported by this study, which was funded by the NSA, LLC, the maker of Juice Plus+. The antioxidant activity of greens/whole food powders is often reported in terms of the value obtained from a laboratory test known as ORAC (Oxygen Radical Absorbance Capacity). Many products on the market claim to have extremely high ORAC scores and claim superiority based on that number. Bear in mind that an ORAC score is a measure of a substance's ability to neutralize specific free radicals in vitro (in a test tube) and does not necessarily translate to how that substance will perform in vivo (in the body). The reverse is also true, for example, vitamin E, which is known to be a powerful antioxidant in the body, has a very low ORAC score. There is also some debate as to the benefits of antioxidants, and there are possible negative effects of large amounts of antioxidants. The FDA does not permit "antioxidant" claims to be made on supplements unless specifically referring to the antioxidant activity from select vitamins, such as vitamin C, or the mineral selenium. The antioxidant activity of polyphenols and other plant based "antioxidants" cannot be legally promoted on labeling. A benefit sometimes promoted for products made from "greens" is that they are alkalizing, meaning they help to keep the body's pH at an optimal alkaline state. Our blood is slightly alkaline, with a normal pH level of between 7.35 and 7.45. However, the typical diet is more acidic, which, according to the alkaline diet theory, disrupts this balance, promotes the loss of essential minerals, and is thought to make people prone to illness. "Alkalinizing" greens are purported to help restore this balance, improve overall health and prevent many chronic diseases. There is little evidence, however, to suggest that an acid-producing diet is the foundation of chronic illness or that food consumption will easily change the pH of your blood. Your body has a complex system of checks and balances to keep the pH of blood tightly within the range noted above. The foods you eat can temporarily increase or decrease the pH of your urine or saliva, but will have little to no effect on the pH of blood. There is some evidence that supplementation with sodium bicarbonate or a combination of alkaline minerals can slightly increase blood pH, but still within the normal range (Webster, Med Sci Sports Exercise 1993; Vormann, J Trace Elem Med Biol 2001). Alkaline diets may, however, help prevent the formation of calcium kidney stones, osteoporosis, and age-related muscle wasting (Schwalfenberg, J Environ Public Health 2012; Dawson-Hughes, Am J Clin Nutr 2008). Neither the U.S. Food and Drug Administration (FDA), nor any other federal or state agency, routinely tests powders with greens/whole food for quality prior to sale. A quality concern specific to these products is potential contamination with heavy metals (arsenic, cadmium, lead and mercury in products containing spirulina and kelp), microbes, and toxic pesticides obtained from their growing environments. Even if ingested at low levels, these contaminants can accumulate and cause damage over time. Arsenic, for example, is a carcinogen and can damage organs. Cadmium can cause kidney damage. Lead, which accumulates in bones, can cause a variety of symptoms including abdominal pain, impaired mental functioning, high blood pressure and anemia. Mercury has toxic effects involving primarily the kidney and central nervous system. (See Concerns and Cautions for information about ingredients from algae.) Microorganisms can cause disease, particularly of the gastrointestinal tract. 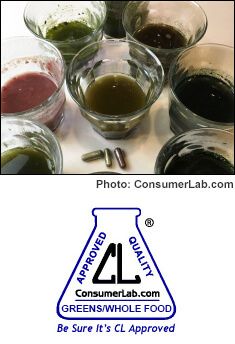 In ConsumerLab's last tests of greens and whole food products, in 2016, three products were found to be contaminated with heavy metals: Barlean's Greens (5.7 mcg of lead per 8 gram scoop; Greens Organics + Superfood RAW (6.5 mcg of lead per 8 gram scoop); and HealthForce SuperFoods Vitamineral Green (3.6 mcg of lead and 13 mcg of arsenic — of which 2.3 mcg was inorganic arsenic -- in its maximum suggested daily serving size of 1.5 tablespoons, weighing 10 grams). To see if products were contaminated, and as part of its mission to independently evaluate products that affect health, wellness, and nutrition, ConsumerLab.com purchased a variety of these products (see How Products were Selected). Each product was analyzed for levels of arsenic, cadmium, lead, and mercury (in products containing spirulina and kelp), as well as pesticides, and microbes. Results were compared to established standards for contamination (see Testing Methods and Passing Score). Also, any product that claimed to be "gluten free" was tested for gluten. Due to the wide range of ingredients in these products, ConsumerLab.com did not test for the accuracy of ingredient listings as it does in other Product Reviews which focus on specific ingredients. Greens and Whole Food Powders and Capsules!